Cawarden are proud to announce the securing of the contract to demolish the Former Derby Royal Infirmary. The contract is within the heart of Derby, the home of Cawarden Co. The majority of the Cawardens workforce have been raised in Derby and have visited the hospital on numerous occasions over there life. Following the securing of this project and various other large demolition projects located all over the UK Cawarden have employed over 20 new employees. The project shall last for around 40 weeks and works began on February 16th 2015. This interesting project includes a wide range of activities across the 17 acre site, ranging from single story basement structures to a 13 storey residential tower block. All buildings shall be demolished down to slab level, following this all slabs and foundations shall be raised and crushed to a 6f2 graded material. Cawarden have recently been award the contract to demolish all of the former Prodrive Factories, located Banbury. The demolition works are a big talking point with people all over the UK due to the iconic symbol of Prodrive Ltd.Who are one of the world’s largest and most successful motorsport and technology businesses. Cawarden have began work on 16th September 2014 and are operating under an extremely tight schedule to enable Mclaren Developments Plc to begin with the development works. Plans have been approved at the Banbury Gateway site and will house retail units including M&S, Next and Primark, on a site alongside the M40. The contract for Cawarden Co consists of the demolition of 6 large Factories buildings previously used as offices and workshops by the Prodrive team. The buildings are of steel framed construction. All hardstandings and foundations are then due to be raised and crushed. This shall then be left on site ready for use by Mclaren during the construction works. Cawarden have begun the works with there Komatsu LC-7 450 High Reach doing the majority of the demolition works with one of our new JS220's working alongside seperatling materials. Cawarden will change to full attack mode week commencing 6th October, with the arrival of 3 more Komatsu Machines. Cawarden has shown once again its commitment to the environment by purchasing two brand new Komatsu 210 LC-10’s. These machines are the latest generation of excavators and contain an all new EU Stage IIIB/EPA Tier 4 interim engine. With its reduced fuel consumption and lower emissions, Komatsu have produced a great product that is now a vital part of Cawarden's machinery bank. Cawarden have just taken arrival of the machines which are full demolition spec, the complete tool for the demolition process. The machines have been dropped straight into the deep end at a challenging ground remediation project Cawarden Co are currently undertaking. They are being put through there paces by Cawarden’s highly experienced machines operators Colin Williams and Danny Butson. Colin says ‘These new machines are brilliant, a cracking bit of kit. They are extremely smooth and strong perfect for every job we are likely to encounter'. Cawarden Co Ltd Managing Director William Crooks is now the proud Midlands and Welsh Regional Chairman of the National Federation of Demolition Contractors. 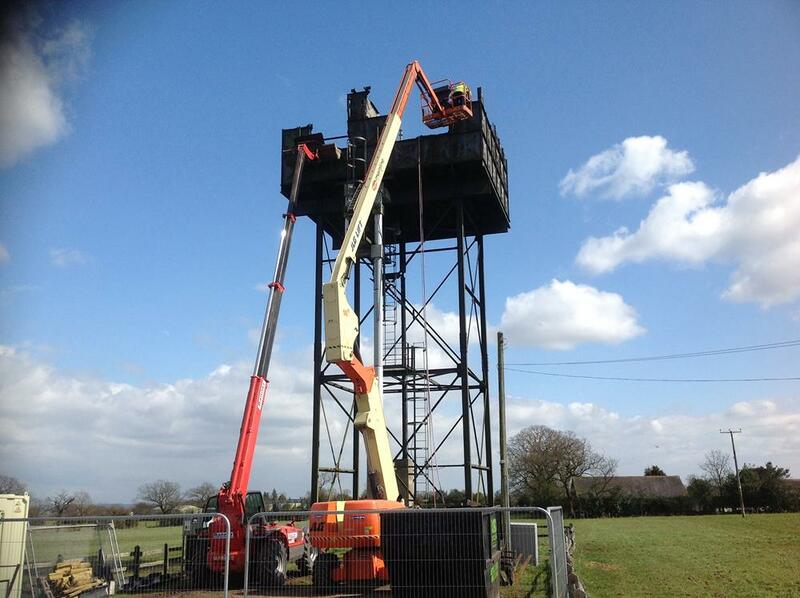 Cawarden Co Ltd, Midlands and Welsh NFDC members, have recently undertaken the demolition of three 30 metre plus high towers, all of dissimilar structures and each one requiring a different technique to ensure they were removed safely, on time and as instructed by the client. Each tower removed by Cawarden was at a separate location and in completely different surroundings. This was the first to be undertaken in January 2013 and was situated within the live Tarmac Plant near Swadlincote, Derbyshire. 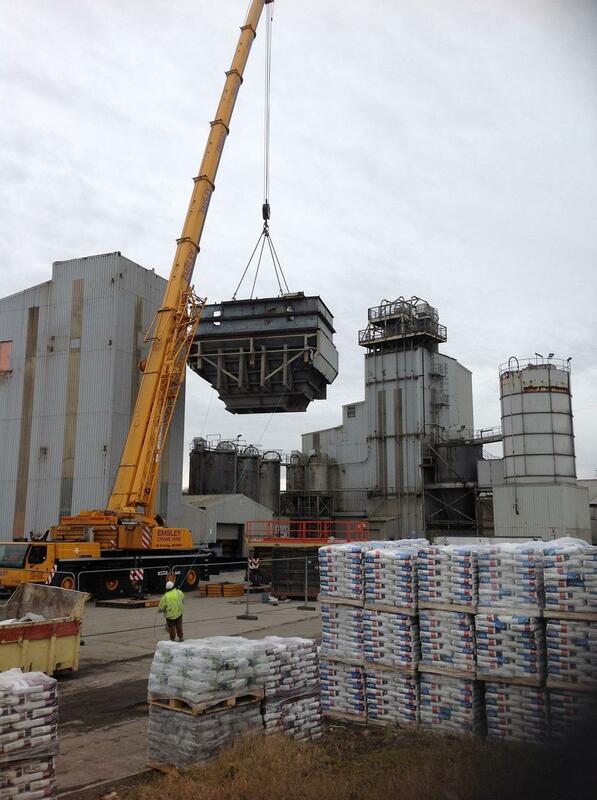 The contract was for Tarmac PLC and their specification consisted of removing the top 15 metres of the mixing tower, cutting out internal plant and services, and leaving the steelwork cut to an angle that would allow the remaining structure to be over clad. Parameters of this building included having other buildings all around the tower, with a second twin tower at a distance of only 30 metres. Railway lines lay some 50 metres away and machinery was still in use inside the first 20 metres of the tower to be taken down. After meeting with Tarmac engineers, Cawarden's method of works were agreed by both parties and we were advised, by the way, it was a nesting site for peregrine falcons so the whole project, including the re-roof, had to be completed by the end of February! Our Site Manager Mick Whitehead said the biggest problem they had was the extreme cold and high winds, which did delay the final lift by one week, otherwise all went to plan. The second tower was undertaken by Cawarden in July 2013 and was situated in a rural location near Cresswell in Staffordshire. This water header tank stood in the middle of fields accessed only down a long narrow private drive, which led to a house situated 60 metres from the 30 metre high platform with a 20m x 15m Braithwaite water tank sat on top. Staffordshire Water had no access into the farmer’s field and one boundary fence was situated at the base of the tower. On no account must we allow any steel, rust etc. to drop into the farmer’s field and we were asked to take it down ASAP. The Site Manager and Top Burner, Malcolm Lowes' only comment was that the summer heat meant that operatives rotated the cutting times due to fatigue and heat exhaustion with having to wear all the heavy PPE. 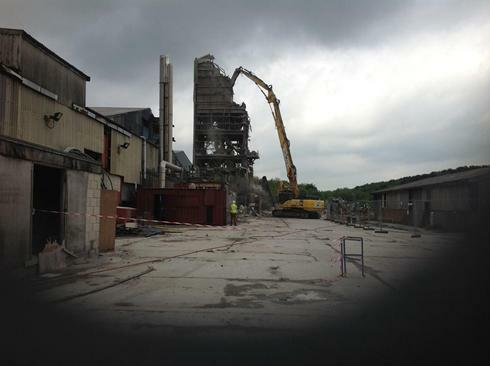 The third tower situated in the redundant concrete panel plant at Kirkby in Ashfield, Nottinghamshire was demolished in September 2013. The 30metre tower this time was more straight forward, standing in the redundant 12 acre site the whole of which was to be demolished and the 1000 tons of scrap processed. Using a Komatsu 450 high reach the tower would be sheared to the ground.